Sometimes, it is almost as if I have to pinch myself to establish that what I am reading is not a dream. A few reports lately have had that effect, not the least being the latest IMF report – Debt Sustainability Analysis (DSA) for Greece, which is forecasting unemployment will remain above 10 per cent for several decades to come. The latest Eurostat data on gross labour flows also paints a dire picture for a nation that has been deliberately ruined by neo-liberal ideology. 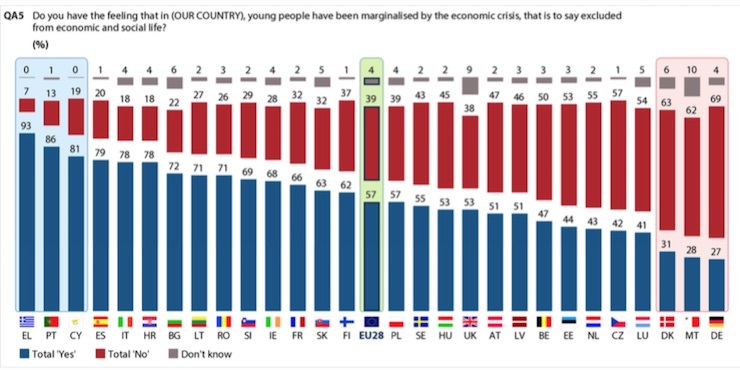 And, the latest Eurobarometer studying Europe’s youth in 2016 tells us clearly how the next generation of adults feel about all this – they feel marginalised from social and economic life. The Troika and its corporate pals are doing a great job killing off the prospects for Europe’s children and their grandchildren, and further on – their grandchildren’s children. People in a few hundred years will reflect back on this period of history as being a dark age where power hungry maniacs dominated the people before the latter revolted and mayhem ensued. The latest Eurostat gross labour flows publication (released May 20, 2016) – 18% of unemployed persons in the EU found a job – tells a continuing story of a seriously underperforming Eurozone labour market. Please read my blog – What can the gross flows tell us? – for more discussion on this point. National statisticians measure these flows in their regular labour force surveys – quarterly in the case of Eurostat. I compiled the following transition probabilities from the latest data for the EU28 as a whole and for Greece and expressed the cells in percentage form. The comparison between the EU28 and Greece is quite telling, as you might expect. An unemployed person in the European Union has a 64 per cent chance of remaining in that state between months (as at the end of 2015). The same person in Greece has a 95 per cent change of remaining unemployed. That person in the EU28 overall has an 18 per cent chance of finding a job in the next month, whereas in Greece the likelihood is only 4 per cent (barely anything). I computed the same probabilities over the 12 month period to the end of 2015 and the chance of an unemployed person in Greece finding a job over that period was ZERO! The chance of a new entrant gaining a job (NE) in the EU28 was 3 per cent at the end of last year (very low). The same person in Greece had only a 0.5 per cent likelihood, in other words virtually zero. The flows shows that in the aggregate (EU28) there is some movement between these labour force states, whereas for Greece there is virtually no movement. The Greek labour market has ground to a halt! The IMF’s latest Debt Sustainability Analysis (DSA) for Greece is one of those documents that you have to take a breath before you realise they are being serious. The Report is largely about the IMF’s belief that Greece will not be able to sustain a primary surplus of 3.5 per cent as is required under the bailout projections. Even if Greece through a heroic effort could temporarily reach a surplus close to 31⁄2 percent of GDP, few countries have managed to reach and sustain such high levels of primary balances for a decade or more, and it is highly unlikely that Greece can do so … and projections suggesting that unemployment will remain at double digits for several decades. Overall conclusion: long-term growth projections will be low and debt restructuring will be required. In other words, Greece cannot meet the Troika demands on debt repayments, bank stability and the rest of it. One doesn’t have to have been trained in rocket science to have known that – back in 2010 – when the Troika entered the picture. The purpose of the bailouts was to transfer private debt into public hands – it was never to help the Greek economy grow again. But apropos of the unemployment projections, on Page 13, we are presented with a Box 2. What is Driving Greek Growth in the Long-Term? which breaks down the three factors that we know contribute to the growth of an economy. 1. Labour force developments (population growth, participation rates, and utilisation rates). 2. Capital accumulation (investment in productive capacity). 3. Total Factor Productivity (TFP) – how much output the economy gets from its productive inputs – if utilised. The IMF claim that the first two factors will undermine growth – “a decline in working-age population” and “investment rates that are unlikely to return to the unsustainable pre-crisis levels”. The current investment ratio (as a percent of GDP) is down to 11 per cent. It has dropped from just over 20 per cent in 2008 – a massive slowdown in productive capacity growth. The ratio is well below what other advanced countries are recording and signifies the depression that Greece has become stuck in due to the deliberate policies of the Troika aided and abetted by a sequence of Greek governments, who really should be tried in the courts for treason against their own people. The IMF claims that growth will only come from productivity growth, which they assert will be “driven by structural reforms” – same old mantra. That is, scorch the economy with spending cuts, deregulation, privatisation, pension cuts, on-going unemployment and, Bob’s your uncle – economic growth will occur. Unfortunately, history doesn’t bear kindly on this strategy. The IMF claim that the reason Greece is still in depression is because the scorched earth hasn’t been scorched enough. The reasonable world abandoned the ‘shock doctrine’ when Sachs and his morons blew up Eastern Europe. … requires continued structural reforms to be delivered at a much faster pace than achieved so far. That is, blame the Greek people and their governments for failing to toe the Troika line fully. Never mind that these policies have seen the economy shrink by nearly 30 per cent so far and the end of the contraction is not in sight yet. This is an organisation that has outlived its usefulness (by decades) and should be the target of austerity among its funding governments and closed! But their commentary on the prospects for the labour market in Greece are nothing short of hypnagogic – a really bad dream at that. Note the claim that 80 per cent of the unemployment is ‘structural’ and therefore not amenable to policies that might aim to increase employment through spending. This is one of those confidence tricks that the mainstream play to avoid the obvious. Please read my blogs – European Commission is once again bereft of credibility and The confidence tricksters in the economics profession– for more discussion on this point. The OECD did it in 2013 when they claimed that most of the Spanish unemployment was ‘structural’. They claimed that the Spanish full employment unemployment rate had risen to 23 per cent in September 2013 after having estimated it to be 8 per cent in 2010. Any reasonable interpretation of the dramatic rise in Spanish unemployment rates as real output growth collapsed, would lead to the conclusion that the post-2007 period was a cyclical event. The same goes for Greece. Here is a challenge to the IMF. If the Greek surrender-monkey government was to announce today that they would provide a job at a decent minimum wage to anyone who wanted to work in community development, environment care, personal care etc – that is, a Job Guarantee – how many of the unemployed would line up? Only five of the current 25 per cent? My bet is that the Government would be flooded with workers wanting to work and establish some sort of income security. In other words, a spending expansion (JG) would wipe out most of the Greek unemployment within a few months – which means the unemployment is not structural and immune to spending increases. But that point aside, this is a nation being ruined by policy ideologues, who refuse to acknowledge that more spending is required in the economy. Bailouts that mostly go to foreign bankers and the elites do not add spending to the Greek economy. Please read my blog – Greek bailout money goes to banks and corporations – who would have thought? – for more discussion on this point. There is a lot of hot air exuded by mainstream economists about how on-going fiscal deficits and the associated public debt (because government, unnecessarily, continue to provide corporate welfare in the form of debt-issuance) undermine our children and their children’s future. The latest Eurobarometer poll – European Youth in 2016 – provides a solid indication that the mainstream policy of austerity is undermining their future. One should link this sort of evidence with the polling I reported in this blog – Greek bailout money goes to banks and corporations – who would have thought? – which shows a fast increasing proportion of Greek people are against the euro and think they would be better off with their own currency. Here is the graphic that summarises the results of the question about Youth and Jobs. 93 per cent Greek youth fell that the crisis has marginalised them – excluded them from “economic and social life”. 86 per cent in Portugal. 79 per cent in Spain. 78 per cent in Italy … and so on. This is the handy work of the European Commission and the IMF. It is inconceivable that after 8 years of crisis that the elites could still hold sway. And we know that the political instability is starting to reflect the growing social instability. The elites can only batter a people down for so long. The Greek data continues to take my breath away. The ‘European Project’ is slowly but surely self-destructing. With an entire generation in some nations now alienated from the mainstream narrative, it is only a matter of time before, major shifts at the political level occur. The fear is that it is the right-wing parties that are making the play for this generation. The Left continue to prance around raving about the great vision of a united Europe and restoring democracy etc. It’s frustrating to have good responses laid out to these issues so clearly, but people just don’t seem to get it. Why aren’t more people listening? It’s not like the “Austerity doesn’t work narrative” is some obscure MMT position either. Lots of people recognize that austerity is counterproductive. Hell, we’ve been using keynes for the better part of a century, but all of a sudden people are making excuses and ignoring what has always worked. I’m tired of people acting like this is a complex inscrutable problem. Sure there are complex aspects, but the basics seem pretty straightforward. It’s frustrating being a young person right now even in U.S. Yet our unemployment is nowhere near that of Greece. I can’t imagine what it’s like for them. I’m just tired of the BS. I don’t care about the paycheck as much as I care about doing something worthwhile, that helps people secure real needs and enjoy better quality of life, not simply indulge cheap consumerism. It’s just so frustrating. The institutions making decisions in EU seem so out of touch, or simply to have given up on trying resolve this stuff effectively. They seem to view it as a greece or a spain problem, not a bigger problem. Although much less severe, the same kind of short sided thinking plagues us in the U.S. as well. Anyway. I had to rant. Thanks for all your articles and consistent and dedicated work. A neoliberal Malthusian nightmare is upon us. AGW will finish the job of destroying all semblance of civilization within decades. This is Orwellian double speak at it’s worst (best). It’s like the Troika is patting people on the head condescendingly for acts of self mutilation. The real heroes are those doctors who are giving their time free to keep clinics open and the public who are supporting each other. Daniel – We all need a good rant now and again! At least in the US there are signs that people are sick of the BS. In that respect you are ahead of Britain- where people are more asleep under the neo-liberal cosh. I would have liked Sanders to get nominated bu it looks like ‘Shillary’ will get it. In this case , if I were American, I’d probably vote Trump just to put the cat amongst the pigeons. Good to hear a young person like you asking the real questions – good luck. To respond to Derek’s question: “Why aren’t more people listening?”. I get the sense that more people are becoming aware of the need for a new economic framework, with a more reliable evidence-based foundation. There are also communicators out there highlighting the social and economic issues and trying to set out the language and ideas for all of us to discuss these problems coherently. Yesterday, I saw a recording of a talk by George Monbiot talking in Edinburgh (it’s on youtube). One of the aims set out by him is to identify the Neoliberal consensus that currently prevails. This first step is necessary, so that everyone can recognise the Neoliberal framework for what it is. Then we can assess the pros and cons and rationally develop and discuss a better framework (one that works for all – not just the wealthy). I would suggest that everyone raise the issue of ‘the Neoliberal political consensus’ in daily interactions – get the term into widespread usage so that the media can start using these terms. Does MMT have a plan ??? do we have a think tank that is trying to push change ?? As long as that? It’s happening already. Just look at the Twitter feeds from France that go unreported in the media. I can see it happening in my lifetime and I just turned 73. The German communist Karl Liebknecht once wrote, “Der Hauptfeind jedes Volkes steht in seinem eigenen Land” = “The main enemy of every people is in its own country”. Fortunately, that’s not always true, but it is true for for the EU today, where the main enemy of the majority are the neoliberal austerians and euro worshipers. Of course, what is going to happen is that the main enemy will be seen as the immigrants and Muslims. True, there is an Islamic problem, and immigrants have brought more costs than benefits, but they certainly aren’t the main problem. Likewise, in the US, Trump notwithstanding, the main enemy of the majority is the Republican Party, which electorally may be the part of white Christians, but which in terms of policy is the party for the rich minority. The US would be better off today if it hadn’t taken in any Mexicans or Muslims, but the reason why most Americans are either stagnating economically or retrogressing is that the plutocratic Republicans care more about profit opportunities for the few than economic security for the many. What every Western country needs is a political party that is social-democratic but at the same time opposed to immigration and skeptical about globalization. Mark; What MMT makes clear is that there is far more fiscal policy space available for politicians to use than what is admitted by the mainstream (Chicago school). Many “plans” are possible by political choice unrestrained by the mainstream lies. There is no natural force which necessitates the prescription of austerity. So, the plan would be for governments to use the sovereign right bestowed upon them by the people to issue currency, ie spend; in ways that ensure everyone is employed (at things that improve social and environmental conditions). Full employment should be the goal. The one concrete prescription that does seem to emerge from MMT is for a national level job guarantee JG as a guiding principle for economic development. A JG is preferable to a guaranteed income because it doesn’t just guarantee income, it also guarantee’s the participation of employed people in the process of creating productive output. There has never been greater need than at present for full and wisely chosen employment of the global population, and yet all we see are the pathetic efforts of neoliberalism to keep us living in the past. No “think tanks” are needed. What we need, is responsible government, fully engaged in the process of responding to these challenges. In the US the Democratic party is the Republican part with a bit of lipstick. It’s every bit as Neo-liberal as the GOP. There is a difference. The GOP in being neo-liberal etc is not betraying its base,but the Democrat elite IS betraying its base. The GOP just seems more looney. The Clinton democrats hide better their nefarious ways. The repealing of the Glass-Steagall act was not an aberration! Hillary/Killary will just inflict more pain on an already tortured majority. My money is on Bernie but he’s fighting the Dem elites as well as the Donald. Their Karma will come for them if HRC wins the nomination and loses to Trump, knowing that Bernie would win against Trump. Interesting times. As for Greece the Troika are using Greece to put the frighteners on other PIIGS nations. See what we’ll do to you it says. It’s so toxic it will kill the EU or at least the monetary union part. It is a tragic situation. Terrible. But the people of Greece don’t seem to want to leave the Euro for some reason. Why is that? It is their own children you are talking about. They had leaders who understood that they should be willing to leave but they rejected that. At this point, I would say that the Greeks are complicit in their victimization. Which doesn’t mean its not a terrible thing. But what can you do? One out of three potential outcomes is what he calls the New Colonial Pact and I call the mezzogiornization of Southern Europe (a process similar to the fate suffered by Naples, once one of Europe’s most vibrant cultural capitals, after Italian unification). What explains the collaboration of the governments and elites of the Southern European countries with the destruction of their countries? I suspect that the best explanation is that we have a “comprador” elite; similar to the native elites that were subservient to the interests of the Portuguese colonial empire. These forces are working in Australia too. I know Bill has written about this. From my perspective, as a baby boomer who fathered twins late at age 40, I can now see my twins at 22 having enormous trouble getting even basic jobs. This is despite the fact they are both university graduated with professional qualifications with honours. They have had to spend months on unemployment and then accept part-time, irregular, insecure work for which they are vastly over-qualified. Some prospective employers would have expected them to work free as interns just to receive training. At the same time they have HECS debts which must be paid off one day. The situation is crazy and inefficient. My estimates are that my children have cost about $500,000 each to bring up and educate. This is fine but I expect them to be employed and given a secure place in our society. They have made the efforts to become well socialised, well educated and useful people. Yet our society now wants to thrown them on the scrapheap or make them wait years for useful, wel-paying work so they can forge independent lives. Neocon economics is a disgraceful, total failure. Given my time again I would never have set foot on a University campus let alone waste seven years of my life there. Of those I graduated with I was the only one that subscribed to MMT and for that I certainly paid a price. Unless you have the personal and academic skills/ traits of someone like Bill [ which I don’t] you will be eaten alive and thrown on the scrap heap as soon as you oppose Neo-Liberalism let alone start criticising it via the findings of MMT. Simonski: You have Jeremy Corbyn, who is a better Sanders than Sanders. Get out and support him. Margaret Thatcher (2002) Statecraft: Strategies for a Changing World. And this was well before The Treaty of Lisbon that established the neoliberal order as an in practice unreformable constitution. “The fear is that it is the right-wing parties that are making the play for this generation. The Left continue to prance around raving about the great vision of a united Europe and restoring democracy etc. It leaves people with no choice. As it looks in most of Europe what ones did go for Labour/Socialdemocracy and the Left is no in total ruins, the ordinary Right Wingers and the so called nationalistic far-right parties is in supermajority all over the place. Even if the latter is a mixed group and divided about EU they are Right Wingers. Labour/Socialdemocracy are committing a slow suicide by joining the “ordinary” Right Wingers to “save” EU.